Welcome to Online Income 101! This tutorial will guide you on how to start with an online business from home, with zero experience. I have put this series together in the most comprehensive manner I could possibly think of. In this tutorial, I use the examples of a real website I am currently developing, PurePinkSalt.com. From Lesson 1, you will see how I came up with the niche (topic), how I decided on the name of my website, and how I write each article, etc. 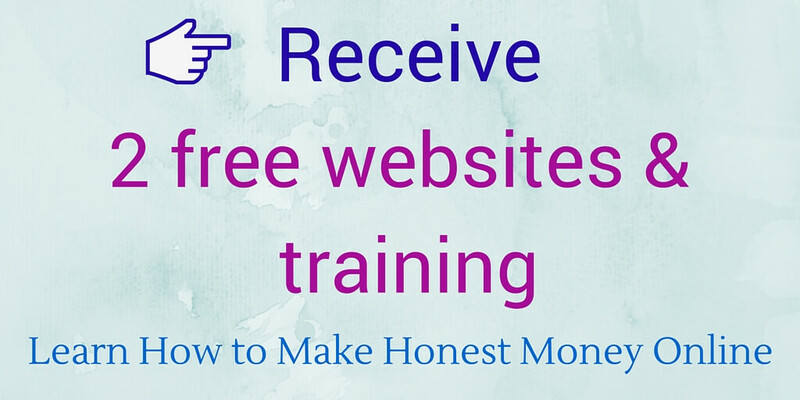 It is my hope that by sharing examples from a real website, this tutorial will give you a good idea as to how online business works and how you can also start one from home during your spare time. I work a very demanding full-time job and still could develop my business site on the side. I could do it, why not you? I hope Online Income 101 is going to be a great learning experience that may possibly change your life down the road! 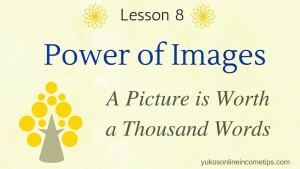 Online Income 101 consists of 10 lessons. The goal of this course is to help you set up an affiliate marketing website. I’ll walk you through each step of the process by sharing the development of my new site. 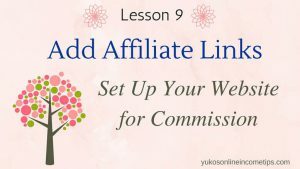 By the end of Lesson 10, you will have your own website up and running linked to one affiliate program (if not more) such as Amazon. I need to ask you a question before we start. Do you know what affiliate marketing is? In case you are not familiar with the term, let me briefly explain. Affiliate marketing means you promote other people’s products and earn commissions by doing so. Related Article: What is Affiliate Marketing? As I said, affiliate marketing is the easiest way to start out online, but it’s not easy to master. There are lots of factors involved in the steps listed above, and it takes learning and devotion on your side. But I would say it’s totally worth your effort. Think about this, once you established a successful affiliate site, it will be up and running 3, 5 or 10 years from now and keep generating income. That’s a real passive income. And the best part is that you are not going to be done with just one website. You will be creating more sites once you have mastered how to be successful with affiliate marketing. The skills you acquire will be your lifetime asset. Before we start, let me share with you the basic tools I use everyday for my online business. Since I will walk you through every process based on how I run my website, these tools are going to be mentioned throughout the course. You do not have to have them all just yet. However, at least, sign up for a free membership at Wealthy Affiliate University as I utilize their resources to help you better understand each lesson. Please rest assured it is an entirely legitimate program and there is no need to provide any payment information for the wonderful resources they offer. Set up a profile and contact me within the university so that I can help you on the inside as well. Below you find the entire flow of Online Income 101. Each lesson is explained with the examples of my new website, PurePinkSalt.com, to help you understand the process better. Follow each lesson in order and please do not skip. Do not rush. Even if you don’t comprehend the content at once, that’s ok.
Take as much time as you need for each lesson. Do leave me a comment in each lesson if you get stuck or contact me within Wealthy Affiliate whenever you need my help. 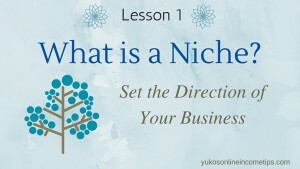 Lesson 1: What is a Niche? Your online business will be built around the niche you pick. What niche do you think would work for you? What aspects do you need to consider when selecting a good niche? 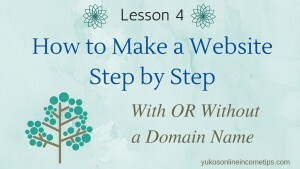 In Lesson 2, you are going to learn what makes a good name for a website and why it is important to match it with your domain name (website URL). You don’t have to be too nervous about domain name at this stage, especially if you are starting with a free site. Nonetheless, the lesson is important to understand what big a role your site name and domain name play for your business, so be sure to go through it. 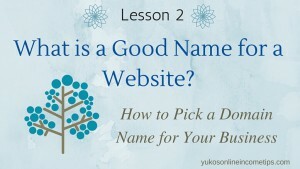 Lesson 2 also teaches you how to check if the name you have chosen for your website is a good keyword or not. 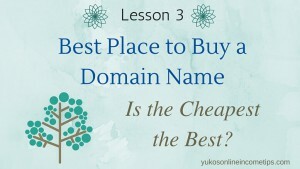 Lesson 3: Do I Need a Domain Name? Now that you have selected a name for your website, it’s a perfect time to purchase a domain name. Again, this is the step you can skip if you are going to choose a free website. Bear in mind, though, that 140,000 new websites are being created every single day and domain names are being sold every second, especially popular ones with dot-com (.com). If you are serious about branding your business, it’s recommended to obtain one sooner than later, while the one you would like is still available. I introduce a place that I trust the most with my domain names. I also walk you through every step of the purchasing procedure. Finally, you are ready to create your own website! There are two possible cases here depending on what you chose to do in Lesson 3: With OR without a domain name. 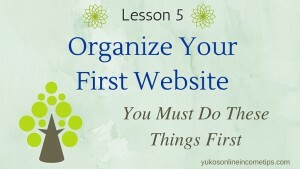 By the end of Lesson 4, your brand new niche site will be up and running on a reliable hosting site. 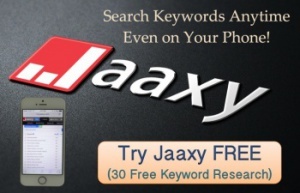 This website is going to be the center of your online business. In Lesson 5, you are going to delete dummy contents that are there by default and tidy up your website. This is the step that is incredibly important and yet many online marketers skip in the beginning. Please do not skip this step. 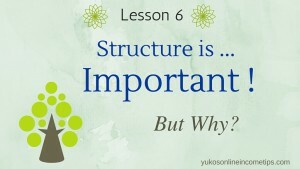 Through this lesson, you will learn why website structure is vital to your online success and how to better organize it. I’ll also share with you how I organized my new website (what categories I created) and where I got those ideas. 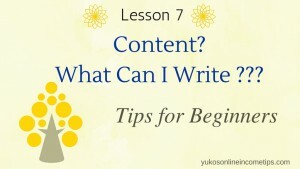 Lesson 7: Write Your Content! This is going to be the meat of your online business: Content! Content is what makes your website unique. You express who you are through your content. You offer your values and contributions, and that is how your readers feel connected with you as a person. In this Internet era, content can be in other forms such as videos or podcasts. For you beginners, however, I focus on written content (articles/blog posts) in this lesson and tips on writing good ones. By the end of Lesson 7, you will have one article page published that tells your audience what your website is all about. To make your content more attractive and enhance reader experiences, we learn how to add images to article posts you create. In this lesson, I’ll explain where you can find free images, how to modify them to your liking, how to compress them, and how to upload them within your posts. Once you master the process of adding images, your content starts looking original and visually appealing! You have launched a website to learn how to start with an online business and now it’s time to set it up for revenue. In this lesson, you are going to join affiliate programs within your niche and embed affiliate links from those companies in your content. I’ll walk you through the process adding links and banners with examples from my new niche site, PurePinkSalt.com so that you can see the real examples of how it’s done. 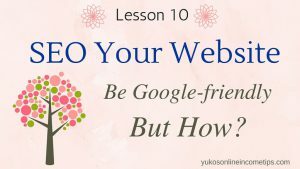 Our final lesson is about setting up your website ready for SEO (Search Engine Optimization). I’ll explain what SEO is, why it is important, and how to properly set up your site first time by using a plugin. Later in the lesson, I provide you with a basic SEO checklist that you can use when you create each content (page) on your website.